Confession is a sacrament instituted by Jesus Christ providing a means for those who fall into sin after Baptism to be restored into God's grace. It involves the admission of one's sins made to a duly approved Priest in order to obtain absolution. 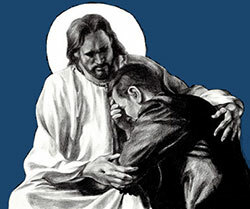 The sacrament of Penance is the way which God has chosen to administer that forgiveness. Jesus exercised the power to forgive sins "that you may know that the Son of man has authority on earth to forgive sins" (Mt 8:6). And Jesus to the Apostles in Jn 20:21-23 reads: "... As the Father has sent Me, so I send you. And when He had said this, He breathed on them and said to them: 'Receive the Holy Spirit. Whose sins you forgive are forgiven them, and whose sins you retain are retained." Note that this power bestowed upon the Apostles is different than the power previously given Peter of binding and loosing, which is the broad power in matters of faith and morals; this power is specific to sin. Knowing that the Apostles, mere men, were incapable of handling such a responsibility on their own power, Jesus Christ gave them a special communication with the Holy Spirit (pneuma) for this special work. In all of the Bible, there are only two instances where God breathed on man, the other was when He gave man a living soul in Gen 2:7 - thus emphasizing the importance of the sacrament of Penance. And as this power was bestowed upon the Apostles, it was to be inherited by their successors, continuing His presence throughout time (Mt 28:19-20). Yes, Jesus is the one Mediator, but that does not deny Him from choosing others to assist Him in his work. Paul, in the name of Jesus, exercised the power of binding and loosing from sin and the effects of sin in the case of the incestuous Corinthian. In 1 Cor 3, Paul says: "I have already judged him that hath done so"; and in 2 Cor 2:10, Paul justifies his forgiveness of the repentant man by saying "If I have pardoned anything, I have done it in the person of Christ". Further, in 2 Cor 5:18, Paul writes: "All this is from God, who through Christ reconciled us to himself and gave us the ministry of reconciliation". And in 2 Cor 5:20, Paul confirms "So we are ambassadors for Christ." Note: the text above was taken from a PDF found on the St Charles Borromeo Catholic Church website. The message / text is excellent, well written, factual and matters not that they are a Vatican II Catholic Church. Thank You, my heavenly friend, for your watchful care. At the moment of my death, bring me to heaven, where the one true God, Who is light, Truth and Love, lives and reigns forever and ever. Begin your confession with the sign of the cross, "In the name of the Father, and of the Son, and of the Holy Spirit. Forgive me, Father, for I have sinned. My last confession was _______ weeks (months, years) ago."